This recipe was supposed to be a little different. I followed, oh so carefully, a recipe from RealSimple. And right when it mattered, I ignored the recipe. Oops. What poured out in a big “PLOP” onto the plate was not all that pretty…but it sure was tasty. Whether you actually let the “cake” cool in a bundt shape, or if you dump it out early, these cinnamon bites will not disappoint you. Enjoy. Tear off small bits of the dough and roll them into 1- to 1 1/2-inch balls. Place the balls on a plate. Combine the cinnamon and sugar in a bowl. 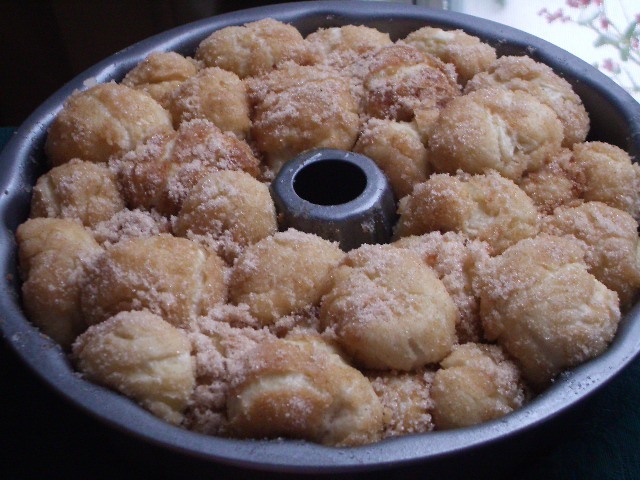 Dip each ball in the melted butter, then in the cinnamon sugar. Transfer the balls to a buttered Bundt pan. Drizzle any remaining butter over the top and sprinkle with any remaining cinnamon sugar. Bake until golden brown, about 40 minutes. Remove from oven and let cool for 5 minutes (here’s where I went wrong…). Place a plate on top of the pan and carefully flip it over. Tap the bottom to release the bread. 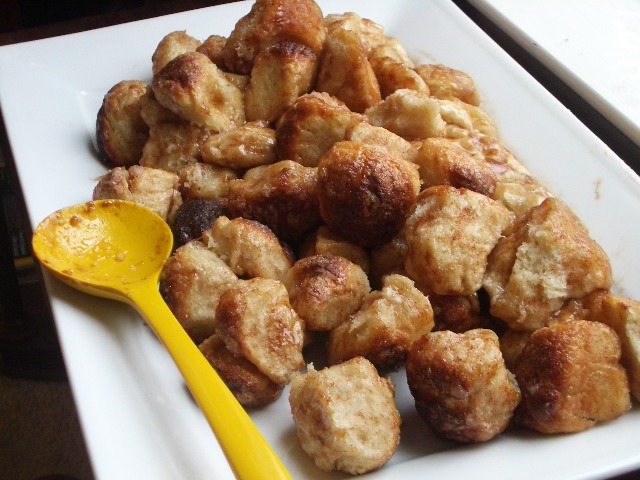 Those look SO yummy, and the recipe seems extraordinarily EASY! I will be making these this weekend for Valentine’s Day, for sure. Thank you!! Well I think this would taste good as a cake or as you ate them. Yum. thanks!